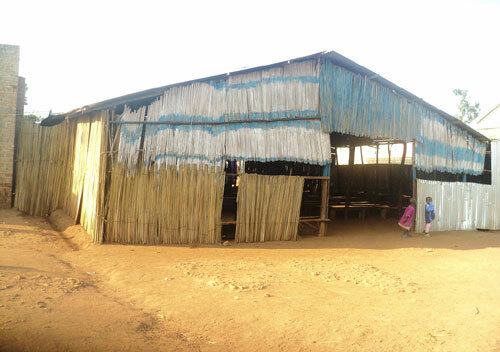 A report released by the education department in Gulu indicates that at least 110 primary school girls across the district missed sitting for their Primary Leaving Examinations last year after being married off by their parents while others dropped out due to pregnancy. The report also shows that majority of the girls who dropped out are those in Aswa and Omoro counties, which are mostly rural areas. The Rev. Vincent Ocen Ochieng, the district education officer, on Tuesday said majority of the girls abandoned schooling before sitting for their mock examinations. “My office will meet with all the head teachers in the district next week to find out solutions to problems the girls are facing in the course of their learning because the rate at which they are deserting school for marriage is exceptionally high,” Mr Ochieng said, adding that the trend calls for urgent intervention. 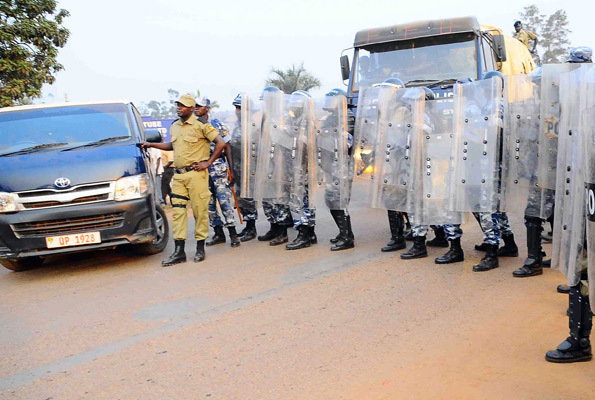 Police block Activists for Change members from accessing a road in Kasubi on Wednesday. Daily Monitor photojournalist Isaac Kasamani was shot at by security personnel while covering the event. The church where Lubega collapsed and died during a healing session. Shock gripped born-again Christians of Deliverance Power Church in Luweero town when a 26-year old man who was undergoing healing, collapsed dead inside the church. Isaac Lubega, a resident of Namukago village in neighboring Nakasongola District, died at around 1am Wednesday morning during prayer time. The cause of his collapse to death has not been established yet, but the Luweero district CID officer said police had launched investigations into the matter. A few days before his emotionally confusing end, Lubega was brought to the church by his mother to be healed from what she believed were demons. 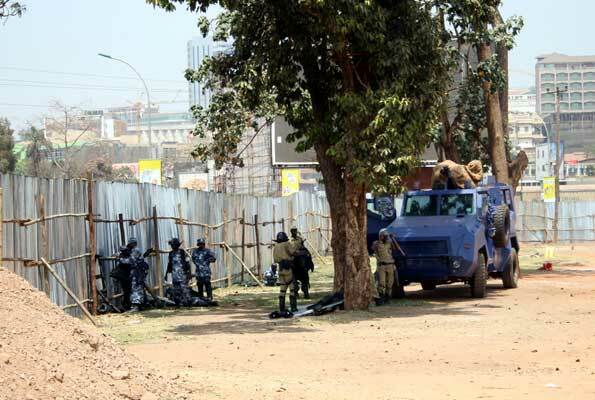 Police officers have taken charge of the controversial land at Clock Tower in Kampala. Muslim youths of the Tabliq sect yesterday declared a Jihad (holy war) against city businessman Hassan Basajjabalaba who is behind plans to redevelop a contested piece of land at Clock Tower in Kampala. Addressing a press briefing in Kampala yesterday, the new Tabliq leader, Sheikh Yunus Kamoga, said Mr Basajjabalaba illegally acquired the land using some unscrupulous former Tabliq sect leaders. “We are not opposing development but we are rejecting this new wave of theft where moguls use unscrupulous clerics for their selfish gains,” Sheikh Kamoga said. Grief engulfed residents of Kasese Municipality when a three-weeks old baby died after undergoing circumcision. The baby’s mother Dorah Muhindo, said she was instructed by the health workers at St. Paul’s Health Centre IV not to feed the baby from 6am since the operation was to be done at 7am but it took place at 11am. A relative, who preferred anonymity, said the child was discharged at 5pm. 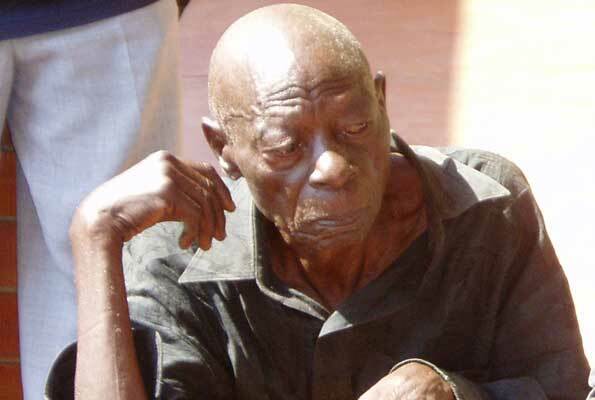 Court in Mukono has remanded a 99 year old man to Luzira prison over charges of aggravated defilement. The court presided over by the Mukono Grade Two Magistrate, Charles Kadisi, remanded Wadada Kisofeeri Onuera, a resident of Namatooke B village, Busamuzi subcounty in Buvuma district for defiling an 8 year old girl.